Founded in 1988, United Internet AG is one of Germany’s leading ISPs, and the parent company of several webmail clients. Between all their services, they have over 47 million customer accounts. One of United Internet’s email clients is GMX, which was founded in 1997. GMX is owned by Global Mail Exchange, a subsidiary of United Internet AG, and has more than 19 million users. It offers a free webmail client, GMX Freemail, which, much like AOL Mail and Gmail, is advertising-supported. It also offers paid options—TopMail and ProMail—which offer additional storage and email addresses for members residing in Germany, Austria, and Switzerland. WEB.DE, founded in 1995, is another email client provided by United Internet. It has 15 million users, and also offers a free, advertising-supported webmail client, WEB.DE Freemail. It also offers professional, fee-based solutions for those with larger email needs. Nearly 54% of emails in Germany are opened in GMX or WEB.DE. 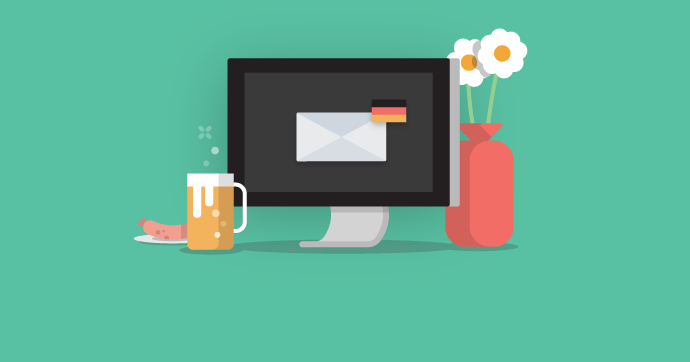 If you’re based in Germany, Austria, or Switzerland (or one of your offices is), or you’re emailing subscribers based in those countries, then you should be aware of how your emails display in these clients—and if they’ll even reach the inbox. Both GMX and WEB.DE make it easy to access email anywhere, on any device. Users can check email via the webmail client and POP3/IMAP. In addition, both clients offer iOS, Android, and Windows Phone apps. GMX Freemail users are granted two email addresses with the domain of @gmx.de (Germany), @gmx.at (Austria), @gmx.ch (Switzerland), or @gmx.net. Both email addresses can be hooked up within one interface, so users can access all of their mail—personal and business—within one app. For those with paying GMX ProMail and TopMail accounts, they are granted more email addresses, as well as a wider array of domains to choose from. WEB.DE users are granted one email address with the @web.de domain. There are premium services for users that need more addresses. GMX and WEB.DE both offer MailCheck services for no additional cost. MailCheck is a browser add-on that allows users to see the number of unread messages in their inbox. It also gives users the ability to take action directly from within their browser—they can write emails, refresh their inbox, view their media center, and check their calendar. MailCheck also allows for desktop notifications. In addition, when MailCheck is set up, the mail storage capacity in both GMX and WEB.DE Freemail increase. Now let’s get to the good stuff—how do your emails display in these clients? Use Litmus Email Analytics to see if your subscribers open in GMX and WEB.DE and get Instant Previews in those clients with Litmus. GMX automatically sorts emails into five categories: Favorites, Inbox, Read, Spam, Sent, and Draft. When a user logs in, they are automatically taken to the Inbox folder. The Inbox folder includes all emails that pass through the GMX spam filter, as well as advertisements. Advertisements are greyed out, and display a logo next to their sender name. Advertisements can be removed from the inbox by clicking on the “X” icon next to the sender name (see “Keuchenportal.de” example above). This disclaimer clarifies that this is an advertisement, and that user data will not be passed on to the advertiser. Since preview text isn’t supported, the sender name and subject line will be crucial for encouraging subscribers to open. Use a recognizable, trustworthy from name, and an optimized subject line. WEB.DE sorts emails into eight categories: Unread, Favorites, Friends & Acquaintances, Unknown, Trash, Spam, Sent, and Drafts. When a user logs in, they are automatically placed in their Friends & Acquaintances folder. Emails in this folder include emails from WEB.DE, as well as those in the user’s address book, and senders they frequently interact with. Like GMX, WEB.DE also supports symbols in the inbox. WEB.DE has advertisements in the inbox, but rather than showing the advertiser’s icon, they use their own logo to distinguish ads from other messages in the inbox. In the example above, the advertisement is for Skoda, a car manufacturer. The subject line translates to “WEB.DE presents Skoda.” Similar to GMX, there is a disclaimer at the bottom of each advertisement. HOW DO GMX and WEB.DE DISPLAY YOUR EMAILS? Similar to AOL Mail, GMX and WEB.DE show emails in an iframe, rather than embedding them. This maintains your email’s original code, rather than reformatting it inline—and it leads to great rendering capabilities. Both GMX and WEB.DE display images by default in the inbox. However, optimizing for image blocking for other email clients is always a great idea. Try using HTML text, ALT text, and bulletproof buttons. However, all messages in the Spam folder have images disabled. And, when this is the case, images are collapsed and ALT text is not supported. Animated GIFs are a great way to add interactive visuals to your designs. Luckily, both GMX and WEB.DE support animated GIFs, so feel free to get creative. However, not all email clients support animated GIFs. Instead, they will show the first frame of the animation. To overcome this, ensure vital information—perhaps a call-to-action, offer, or headline—is included in the first frame of your GIF. While GMX and WEB.DE have great support for HTML and CSS basics, they lack support for advanced techniques. This isn’t unexpected—most webmail clients have similar shortcomings. For example, neither GMX nor WEB.DE support HTML5 video. If you’re using these types of advanced techniques, be sure to have proper fallbacks in place. Lack of support for border-radius won’t affect the functionality of your CTAs. Germany is known for its strict spam laws, and GMX and WEB.DE pride themselves on their high security and privacy standards. Both have a multi-level spam filter, which detects unsolicited emails and moves them to the Spam folder. Distinguishing reputable emails from unsolicited bulk emails based on checksum methods. Analyzing emails for technical properties and errors that are typical of spam. Checking emails for fake sender addresses (i.e. ensuring the email was sent from the server responsible for the domain). Comparing emails with internal and external lists (i.e. IP addresses of servers known for sending spam or URLs that occur in known spam e-mails). In addition, there is also a personal spam filter in these clients. When a user personally marks an email as “Spam” or “Not Spam,” future emails from those senders will be classified in the correct folder. In an effort to promote German email providers as the most secure in the world, four of United Internet’s brands—GMX, WEB.DE, Telekom, and freenet—joined together to implement new security standards. The result of this initiative—“Email Made in Germany”—was launched in August 2013. The program ensures that email traveling between its email servers never leave local servers, which are all based in Germany. Email Made in Germany guarantees that all emails are transmitted with SSL encryption and protected against access from third parties. Secure senders are marked with an “Email Made in Germany” seal. It should be noted that this program is only effective for emails being transferred between GMX, WEB.DE, Telekom, and freenet. If a user from within the network emails a user with a Gmail account, that email will not be encrypted. Users will be notified if they are emailing to an address that does not fall under the program’s protection. Founded in 2009 by email clients like WEB.DE, GMX, 1 & 1, freenet, and T-Online, Trusted Dialog is an initiative that aims to protect their users from spam. Trusted Dialog verifies the authenticity of the sender’s emails through DKIM, ensuring that the sender is who they say they are. After proof of authenticity has been provided, the sender gets the Trusted Dialog seal and their logo displayed in the inbox. Thanks to the seal and logo, users can easily identify trustworthy emails in their inboxes. Many Trusted Dialog brands have seen an increase in opens and clicks as a result of the increased trust with their subscribers. Direct delivery to the inbox—not the spam folder. In GMX, emails are delivered straight to the inbox, whereas in WEB.DE messages are delivered to the Friends & Acquaintances folder. Video content will play within the inbox. Trusted Dialog brands can include video within an iframe, which will display in WEB.DE, GMX, 1 & 1, freenet, and T-Online. In addition, when a user views an email from a Trusted Dialog brand, the email is the focus of the screen—advertisements are removed. Rest assured that your designs look great regardless of where your subscribers are opening.